Ted Cruz and Rand Paul voted against the compromise. (Bloomberg) — The U.S. Senate adopted a fiscal 2016 budget that calls for $5.1 trillion in spending cuts to achieve balance in 10 years, while avoiding proposals to partially privatize Medicare as many Republicans brace for re-election. In the 52-46 vote Friday, Senate Republicans, who control the chamber for the first time in eight years, persuaded enough of their members to back a compromise fiscal blueprint to avoid the embarrassment of a failed vote. Republicans, with a 54-46 Senate majority, could afford only three defections to adopt the budget. Presidential candidate Sen. Ted Cruz, of Texas, and potential 2016 contender, Sen. Rand Paul, of Kentucky cast the only Republican votes against the budget. That action came after the Senate voted in a marathon session on dozens of politically charged amendments that are sure to become campaign fodder. 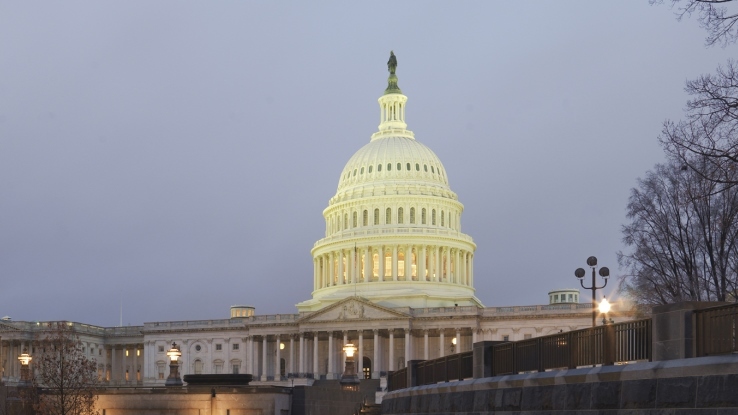 After passing a bill that would exempt grid-enabled water heaters from pending Energy Department efficiency standards and promote energy efficiency in commercial buildings, the Senate adjourned at 4:22 a.m. Friday and will reconvene on April 13. The Senate did not take up House-passed legislation to ward off an April 1 cut in Medicare physician payments. Republicans have long criticized Democrats about the U.S. budget deficit, so failing to adopt a budget would have been a major blow to their new Republican majority. The budget resolution won votes because it backed more defense spending than President Barack Obama has proposed. To appease advocates of more defense spending, the plan places money in a special war-funding account that isn’t subject to spending limits. “It’s the best option we currently have for leaving the next president in a better position to face global challenges,” said McConnell of Kentucky. Senate Republicans avoided a plan to partially privatize Medicare that was embraced by the U.S. House of Representatives in its budget. The Senate plan instead calls for $430 billion in spending cuts without explaining where they would be made. Some Senators worried that the House approach on Medicare, unpopular with voters, would damage them politically in 2016. Next year, Republicans must defend 24 Senate seats compared with 10 for Democrats, a reversal from the past two elections when significantly more Senate Democrats were on the ballot. The Medicare provisions will now be the subject of a House-Senate conference committee next month. Two senators likely to seek the 2016 Republican presidential nomination, Paul and Marco Rubio, of Florida, sought even more defense funding. Paul, who has made a name for himself by pressuring leaders to accept spending cuts, proposed an amendment that would have added almost $190 billion to defense spending over the next two years, and covered the cost by making cuts in other areas, including foreign aid and the Department of Education. It failed. Rubio joined with Arkansas Sen. Tom Cotton to propose a separate amendment to increase defense spending. That proposal didn’t specify any reductions. It also failed. The plan, S.Con.Res. 11, includes $96 billion in war funding in 2016, about $38 billion more than Obama has sought. Democrats described the budget full of “gimmicks,” noting it would repeal the Patient Protection and Affordable Care Act (PPACA) and eliminate health care coverage for millions of people, while keeping the revenue generated by PPACA. Sen. Bernie Sanders, a Vermont independent who caucuses with Democrats and sits on the Budget Committee, said the budget would harm the middle class and poor. “We’ll make it harder for kids to go to college, we’ll throw people off health insurance, but we will not ask the rich and powerful to pay more in taxes,” Sanders said on the floor. If the House and Senate can agree on a joint budget, that would allow use of a special procedure to let Republicans send legislation repealing Obamacare to the president’s desk. Obama would veto such a measure, though Republicans say that if the Supreme Court strikes down most of the law’s federal subsidies in the next several months, Obama could be brought to the negotiating table to change the health-care law. The House budget plan adopted Wednesday in a 228-199 vote, H.Con.Res. 27 differs little from last year’s plan. It calls for cutting poverty programs to provide more funds for defense spending while avoiding tax increases. The final House vote came after Republicans resolved a dispute over defense funding. Lawmakers adopted an amendment to increase war funds to $96 billion without offsetting any of that total with spending cuts elsewhere. Agreeing on a budget plan won’t resolve the fight over raising spending caps for the fiscal year starting Oct. 1 because a budget resolution isn’t a law signed by the president. To raise the caps as defense proponents want will require a deal later this year with Obama and Democrats. Many Republicans consider the 2011 law one of their most significant achievements. Obama’s budget request offered a $38 billion increase for national security programs over current budget caps in exchange for $37 billion more for domestic programs.